Add a Windows Firewall exception on the server for TCP, ports 1433 and 1434 on the local subnet. 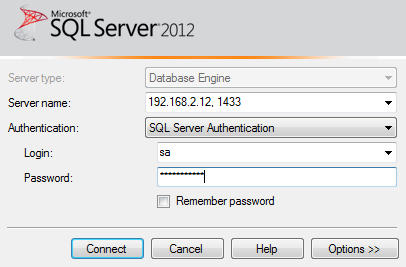 Verify that I have a login on the SQL Server instance for the user I'm logged in as on the desktop. Verify that I'm using Windows Authentication on the SQL Server instance. Repeatedly restart SQL Server and the whole dang server. Pull all my hair out. How can I get SQL Server 2012 Express to allow remote connections!? 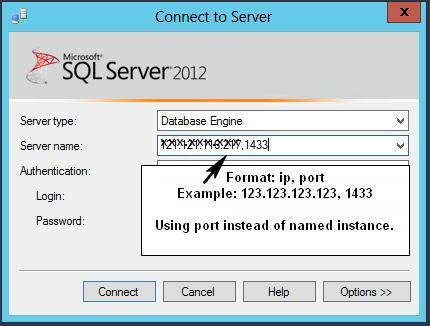 The correct way to connect to remote SQL Server (without opening UDP port 1434 and enabling SQL Server Browser) is to use ip and port instead of named instance. Using ip and port instead of named instance is also safer, as it reduces the attack surface area. This method uses the specified port (this is what most people want I believe).. This method requires opening UDP port 1434 and SQL Server Browser running..
Kyralessa provides great information but I have one other thing to add where I was stumped even after this article. Under SQL Server Network Configuration > Protocols for Server > TCP/IP Enabled. Right Click TCP/IP and choose properties. 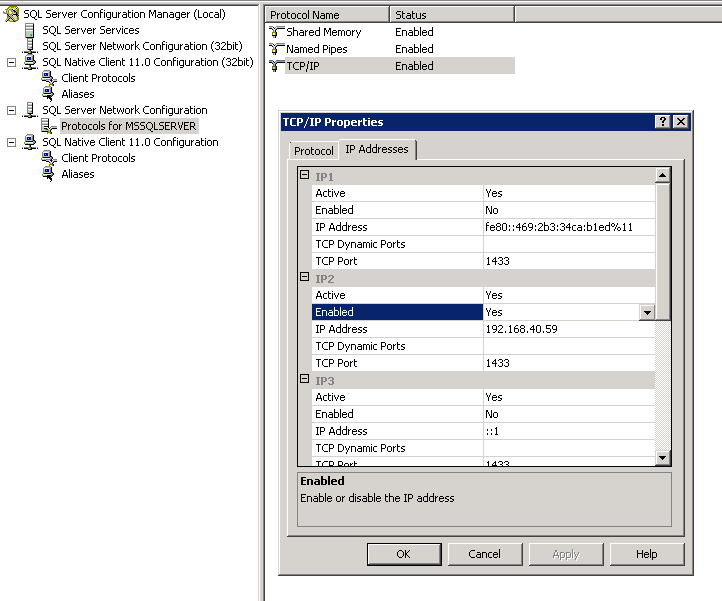 Under the IP Addresses you need to set Enabled to Yes for each connection type that you are using. Go to START > EXECUTE, and run CLICONFG.EXE. The Named Pipes protocol will be first in the list.Demote it, and promote TCP/IP. I had to add a firewall inbound port rule to open UDP port 1434. This is the one Sql Server Browser listens on. I prefer way of "Rosdi Kasim" as that's doesn't require detail configuration on the IP. I will definitely forget it again when I try to up another server again. 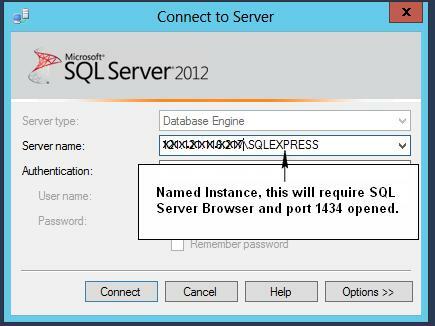 Keep It Simple Stupid (KISS) by simply enable the Sql Server Browser service, then add the \SQLEXPRESS behind the IP when you connect the server. Direct using IP without "\SQLEXPRESS" was my point of failure as it doesn't use the default port. I had the same issue with SQL Server 2014 locally installed named instance. Connecting using the FQDN\InstanceName would fail, while connecting using only my hostname\InstanceName worked. For example: connecting using mycomputername\sql2014 worked, but using mycomputername.mydomain.org\sql2014 did not. DNS resolved correctly, TCP/IP was enabled within SQL Configuration Manager, Windows Firewall rules added (and then turned the firewall off for testing to ensure it wasn't blocking anything), but none of those fixed the problem. Finally, I had to start the "SQL Server Browser" service on the SQL Server and that fixed the connectivity issue. I had never realized that the SQL Server Browser service actually assisted the SQL Server in making connections; I was under the impression that it simply helped populate the dropdowns when you clicked "browse for more" servers to connect to, but it actually helps align client requests with the correct port # to use, if the port # is not explicitly assigned (similar to how website bindings help alleviate the same issue on an IIS web server that hosts multiple websites). when you use wstst05\sqlexpress as a server name, the client code separates the machine name from the instance name and the wstst05 is compared against the netbios name. I see no problem for them to match and the connection is considered local. From there, we retrieve the needed information WITHOUT contacting SQL Browser and connect to the SQL instance via Shared Memory without any problem. when you use wstst05.capatest.local\sqlexpress, the client code fails the comparison of the name (wstst05.capatest.local) to the netbios name (wstst05) and considers the connection "remote". This is by design and we will definitely consider improving this in the future. Anyway, due to considering the connection remote and the fact that it is a named instance, client decides that it needs to use SQLBrowser for name resolution. It attempts to contact SQL Browser on wstst05.capatest.local (UDP port 1434) and apparently that part fails. Hence the error you get. I had a different problem from what all of the answers so far mentioned! I should start off by saying that I had it in Visual Studio, and not SQL Server Express but the solution should be exactly the same. Well, god, it's actually really simple and maybe a bit foolish. When I tried to create a database and Visual Studio suggested the name of the SQL Server it gave me my Windows username and since it's actually the name of the server I went for it. In reality it actually was my Windows username + \SQLEXPRESS. If you didn't change any settings this is probably yours too. If it works, stop reading; this is my answer. If it doesn't work maybe the name is different. Open SQL Server Management Studioicon. If you don't see your server (docked to the left by default) press F8 or go to View -> Object Explorer. At the bottom left you can see your server's actual name under "Server" (not Connection, but above it). This is the name of the server and this is what you should attempt to connect to! not what Visual Studio suggests! One more thing to check is that you have spelled the named instance correctly! In my case the database was running on non standard port. Check that the port you are connecting is the same as the port the database is running on. If there are more instances of SQL server, check the correct one. All you need to do is open the relevant port on the server's firewall. Having problems connecting to SQL Server? Not the answer you're looking for? Browse other questions tagged sql-server-2012 remote-connection sql-server-2012-express or ask your own question. How to connect SQL Server Express database from another Pc? it works locally on IIS but on the host it gives this error! what should I do? How do we alias a Sql Server instance name used in a Connection String .config?